Searching for a Japanese Spitz? Do you see a resemblance between the Japanese Spitz and the Samoyed? It is actually believed that the former is the descendant of the latter, which was bred in Japan to be really small. It is an alert, brave and affectionate breed to its family and wary of strangers. It is not aggressive toward people it does not know and would rather keep its distance until it gets to know them. It is an ideal dog for first-time owners, families with children and the elderly. Has the Japanese Spitz caught your attention? Here is a brief background of this white and fluffy dog. 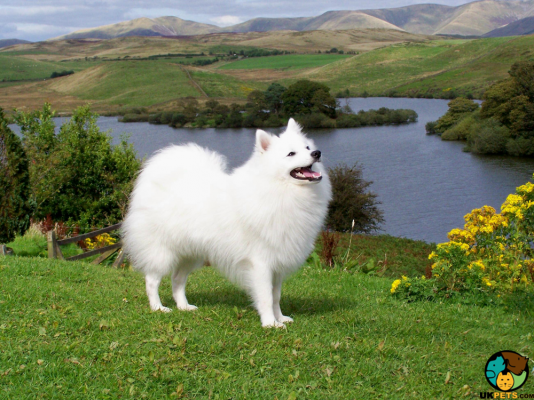 The history of the Japanese Spitz is a mystery with varying stories surrounding its origin. One theory states that when the Samoyed arrived in Japan, it was bred to become a very small breed, which turned out to be the Japanese Spitz we see today. Another belief is that it came from white German Spitz dogs from China that were crossed with different Spitz-type dogs imported to Japan. The final breed standard for the Japanese Spitz was completed after the Second World War. It has become a popular breed all over the world in households as companion dogs as well as favourites at dog shows. It is recognised by major international dog registries, including The Kennel Club under the Utility group. The Japanese Spitz is a little white ball of fur that weighs 11 to 20 pounds and stands 30 to 38 centimetres at the withers. It has a medium-sized head, which is wedge-shaped when viewed from above, as well as a slightly domed skull. It has dark oval-shaped eyes, round black nose, triangular ears, a well-defined stop, nicely proportioned muzzles, and a strong jaw with a perfect scissor bite. 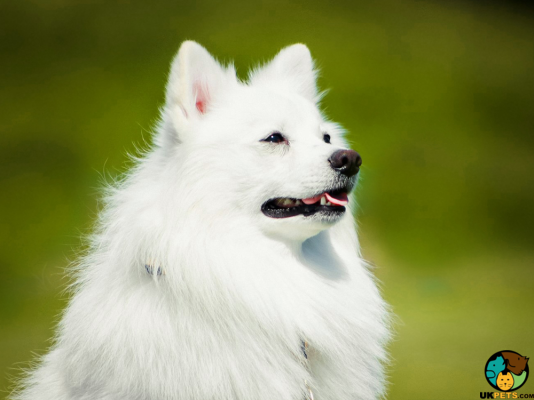 The Japanese Spitz sports a thick double coat that protects it from harsh weather conditions. It has a straight outer coat that stands off its body, and a short yet profuse, dense and soft undercoat. The only accepted colour according to KC standards is pure white. Hair is short on the face, ears, front of its fore and hind legs, as well as below its hocks. The rest of the body is covered with longer hair with mane on its neck and shoulders. Its well-plumbed tail is profusely covered with long hair. Because of its thick and long coat, the Japanese Spitz has demanding grooming needs. It can benefit from numerous visits to the groomer’s in a year to keep its coat tidy and manageable at home. While some owners take care of their Japanese Spitz’s coat on their own, it can be tedious and time consuming. In fact, a weekly grooming programme is needed, which involves more brushing in the spring and autumn when the breed sheds more. To complete its grooming routine, attention must be given to other parts of the body like its ears to ensure that there is no wax build-up. Nails should also be trimmed regularly to prevent uncomfortable overgrowth or cracking. Lastly, brush its teeth regularly to lessen the odds of tooth and gum disease, which is common to small breeds. 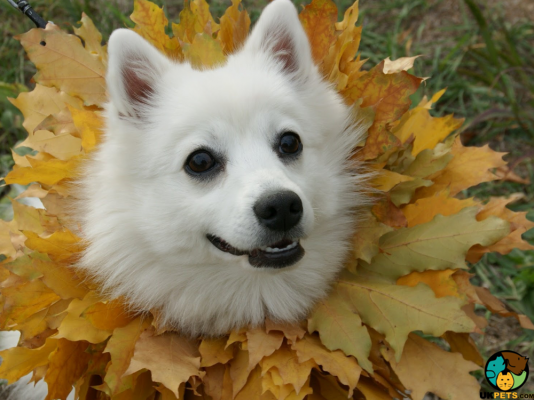 The Japanese Spitz is an alert, playful, and bold dog. It is affectionate towards family and would want nothing more than to be part of everything that goes around the house. It builds a strong bond with family members but tends to be chary toward people it doesn’t know. However, it rarely shows aggressiveness and would rather keep its distance. It is hypersensitive and will easily let its owners know through barking when it senses the presence of strangers, making it a good watchdog. Because of the Japanese Spitz’s warmth and devotion to its family, it is a great companion for first-time owners, the elderly and families with children of all ages. When it comes to kids, it has an affinity with them and would happily play games with them but parents need to keep an eye on interactions especially when there are guests. The Japanese Spitz can be overprotective of its little humans. It usually gets on well with other pets in the household when socialised early but will chase small animals it does not know. 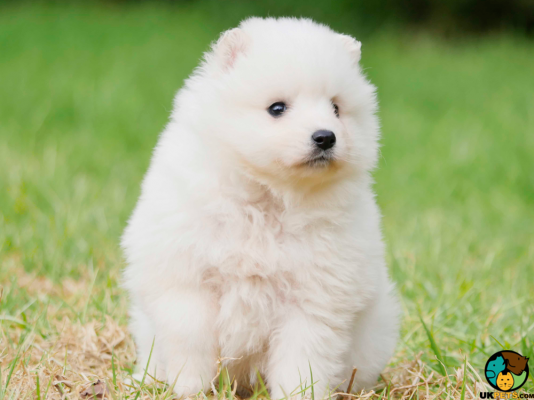 The Japanese Spitz is an intelligent and a people-pleasing breed, making training generally easy. Owners need to be consistent and fair when it comes to correction so it can grow to be adaptable and obedient, keeping in mind that it is sensitive so harsh correction won’t help. It actually enjoys alone time with its master especially when training is filled with positive reinforcements. A typical serving for an adult Japanese Spitz is 1/2 to 1 cup of excellent quality dry dog food per day. It is worth remembering that the amount of food and frequency of feeding highly depend on its age, size, build, activity level, and metabolism. It is always a good idea to ask your veterinarian for recommendations. The nutritional needs of small breeds are different from large ones so it is important that the food you provide be specifically formulated for its size. Should you wish to feed your Japanese Spitz home-prepared food, always choose fresh ingredients and provide supplementation to avoid nutrient deficiencies. Omega 3 and 6 fatty acids are very important for coat health. The Japanese Spitz is a generally healthy dog that can have an average lifespan of 12 to 15 years. It can be prone to a few hereditary health conditions such as skin allergies, runny eyes and Patellar Luxation. 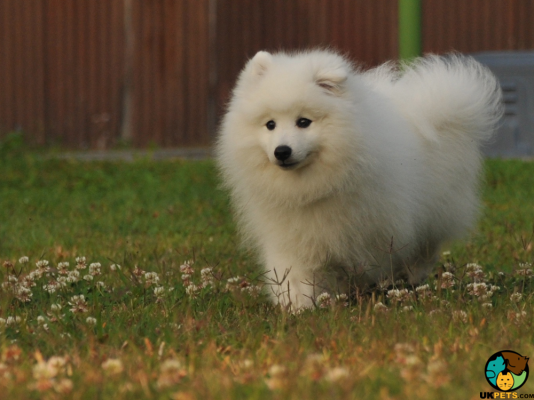 The lively Japanese Spitz need at least 30 minutes of exercise per day. It loves going for a short walk and playing canine sports like flyball and agility. In addition, it must have access to fenced yard so it can let off steam whenever it needs to. Realistically, getting a dog can be expensive but this should not discourage you from caring for a canine companion. It is important to do your research so you will determine which breeds you can afford to care for or if you can afford any type of dog at all. If you want to purchase a well-bred Japanese Spitz, prepare to pay no less than £200. Insuring this type of dog costs around £20 a month for basic coverage and £40 for a lifetime premium. Of course, you have to buy a bed, crate, food and dish bowls, collar and leash, toys, and other equipment to make it comfortable. This will initially cost around £200. Food costs for this small dog will be around £20 to £30, while the cost of professional grooming services can be around £25 to £30, depending on your location and services. Last but not the least, regular veterinary trips for check-ups, vaccination and booster shots, and deworming/flea treatments will cost you around £600 a year. This does not include spaying/neutering, major surgeries and long-term medication. 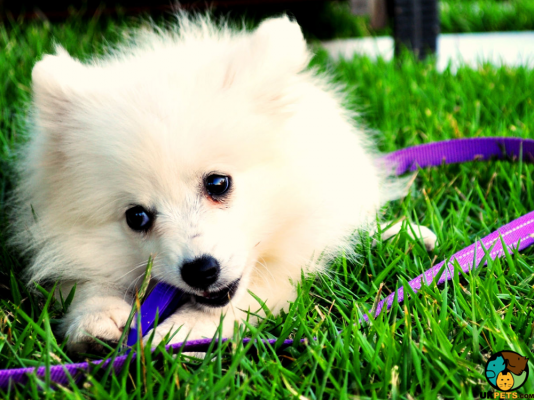 Is a Japanese Spitz Right for You? 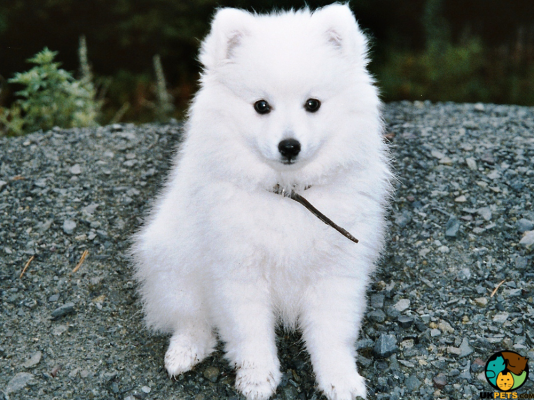 The Japanese Spitz is a small dog that is bold, courageous and affectionate. It is recommended for different types of families, even the elderly and first-time owners. It has an affinity with children but tends to be overprotective of them. Maintaining its long white coat can be tedious and time consuming. It has low exercise needs, usually requiring about 30 minutes of mental and physical activities.